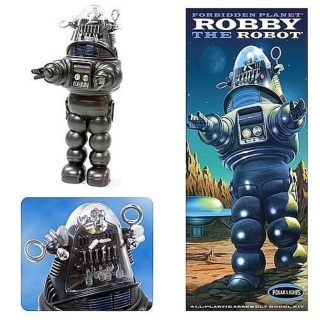 From the classic sci-fi movie, Forbidden Planet, comes one of cinema's most famous mechanical men: Robby the Robot. Robby is the faithful mechanical servant on board the exploratory starship, the C-57D, sent on a mission to the distant planet Altair 4. Stands Approximately 8" tall when fully assembled.